Has US monetary policy been too expansive? The perception among economic observers that US monetary policy has been too expansive during the last decade is usually taken for granted and for an accepted fact. The consequences for this policy would be that inflationary pressures might become real and damaging in the near future and that the sooner the Federal Reserve could reverse that policy, the better would be for long term economic growth and restrained inflationary paths. However, from the observation of monetary figures over a long period of time a somewhat different story might be construed, not in terms of the need to eventually correct for this expansiveness at some time, but on the urgency and degree of this intervention. In other words, prudence might be closer to further waiting and gradually correcting monetary policies rather than frontally intervening present ones. Even before the 2008 financial crisis, the US and world at large had been witnessing a persistent fall in interest rates in both nominal and real terms. That process, started in the mid 1980’s, delivered “risk free” long term real interest rates (as represented by US Treasury 10 year bonds deflated for CPI changes or more recently, Treasury Inflation Indexed securities) falling from 5% per year to levels around 0.5% as of now. Moreover, inflation rates in the US went consistently down from a 14.6% peak in March 1980 to 2% today. When one looks into the other side of the coin, the quantities associated with the above prices for money or, more specifically, the evolution of different monetary aggregates over these decades, it comes into attention that their expansive nature looks much less strong than what the fall in real interest rates would initially – or intuitively – suggest. Furthermore, huge changes in Federal Reserve assets at the time of the financial crisis in 2008 did not translate into equivalent changes in monetary aggregates: commercial banks held so considerable cash balances at the Federal Reserve that they became close to represent 60% of them – on the Federal Reserve liability side – in 2013. The implied velocity of M2 has been going down since 1997, even before the financial crisis took place. It so turns out that the dramatic increase in the monetary base for which the Federal Reserve actively pushed in the midst of the crisis and later years to guarantee the efficient working of the payments system did not get reflected with equivalent intensity in the liquidity the same system was absorbing (as reflected by monetary aggregates), making therefore less pressing their impact in price inflation. In some sense, the monetary base was not available in the economic system as a whole, but partially “hidden” in the Federal Reserve vaults. 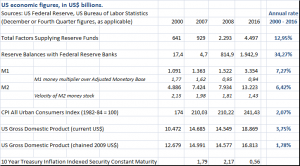 The tables below speak for themselves: monetary aggregates M1 and M2 annually grew between 6% and 7% since 2000, or 3% over US GDP in nominal terms. If we consider a longer period, since 1990 when falling interest rates and inflation trends were settled, M1 and M2 annually grew around 5.5%, less than 1% over US GDP measured in nominal terms. That recent periods have been more expansive than previous ones is out of the question. The point is that the monetary system has delivered liquidity which is still manageable and consistent with long term GDP growth trends and inflation within reasonable boundaries. A world awash in “non inflationary” cash, until now at least. Interesting figures and surprising evolution of them, for which there is no clear explanation. Lower real long term growth, excessive savings, massive technological improvements, lower population growth and extended life expectations and others could be behind these related phenomena, but their connection and causality is beyond our modest understanding. 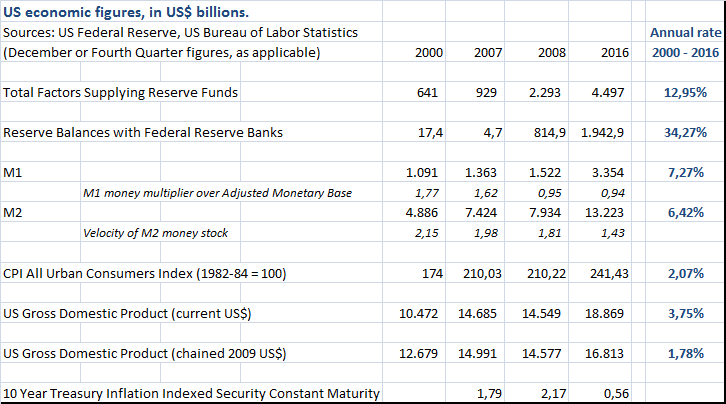 What we could say is that from the observation of these figures and long term trends over a three decade period, there would be enough leeway to orderly correct for apparent excessive liquidity. The Federal Reserve has time and it should make good use of it. There is no need for impatience.